Leah Bonnema is a Stand-Up Comic based in New York City. Huffington Post named her one of their Favorite Female Comedians and College Candy listed Leah as one the Ten Funniest Female Comics. 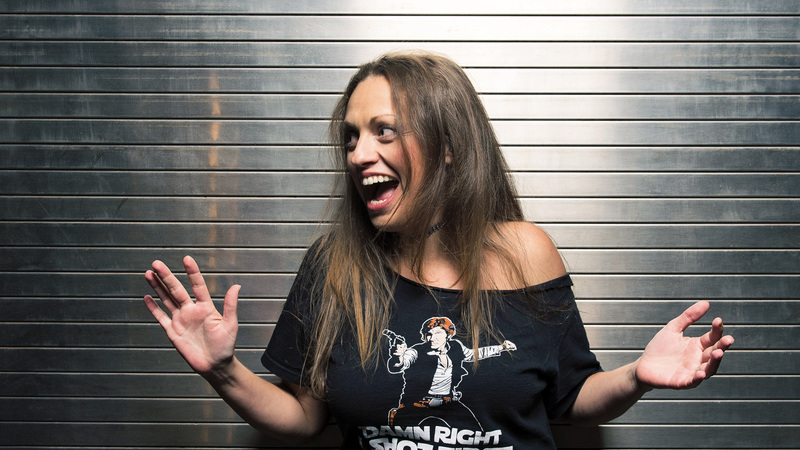 She has been featured on AXS TV’s Gotham Comedy Live, VH1’s 100 Greatest Series, IFC’s Comedy Drop, Above Average, Elite Daily, Arise Entertainment 360, ComedyTimeTV, Internet Action Force, Patrice O’Neal’s The Black Philip Show and is a regular on Riotcast Radio’s The Hole. Leah has had the honor of performing for the troops in Iraq, toured throughout the Middle East and performed for the US Marines at the famed Friar’s Club. Leah was a finalist in ‘New York’s Funniest’ during the NY Comedy Festival and was featured on ‘The America Stands Up Showcase’ at The Magner’s Glasgow Comedy Festival. She has also performed in the Women in Comedy Festival, The 360 Comedy Festival, The Maine Comedy Festival, The NY Underground Comedy Festival, The Reel Recovery Film Festival, The Charleston Comedy Festival, Bumbershoot, AfroPunkFest, The Hoboken Comedy Festival and at The Piccolo Fringe. Leah has opened for comedy legends Darrell Hammond, Kevin Nealon, Paul Mooney, Sarah Silverman, Pat Cooper and Gilbert Gottfried. She headlined the Breakout Artist Series at Caroline’s on Broadway, which was rated a “Top Pick” by AM NY. Leah has been a freelance comedy writer for United Stations Radio, Lizz Winstead’s Lady Parts Justice and Funny or Die’s Billy on The Street. The NY Times said Leah is “one of the city’s most consistently excellent young comics” and The Scotsman called her “A force of nature”. She hails from the mountains of rural Maine and received her degree in Honors Cultural Studies and Women’s Studies from McGill University. Leah loves animals, guacamole nachos and Gandalf.